It is the Boy Scouts of America, after all. Our constituency is overwhelmingly young men – boys – and we frequently think of them as such. However, when it comes to dealing with them in the context of Scouting, it helps to think of them with higher expectations than merely “boy”. Something that Clarke Green recently said in a podcast got me thinking of the distinction between boys and Scouts. 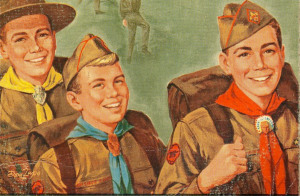 It was in response to a question from a listener about behavior among the members of the troop, and Clarke replied that while boys may exhibit certain types of behavior (such as teasing others or wanting to exclude them from their patrol), Scouts do not. A Scout is expected to follow the Scout Oath and Law. As such, a Scout is held to a higher standard of behavior, responsibility and leadership that a run-of-the-mill “boy” might not. This works two ways. If we think of our charges as boys (or even as “kids”), we’ll view them as ordinary eleven and twelve-year-olds and our expectations of them (and the way we treat them) will fall along the lines of what is normally expected of boys that age. And since there’s a room full of young men of a variety of ages, the way we treat them tends to reduce itself to the youngest age present. However, when we think of them not as boys but as Scouts, the way we treat them changes. 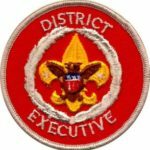 A Scout’s attributes are described in the Scout Law and we have every expectation that they will display these attributes. Enoch Heise describes this very well in this post on Scouting Rediscovered. The term boy merely describes a male child under the age of eighteen, but Scout says something more. It stands for a young man learning character and citizenship and experiencing mental and physical fitness, and who lives his life according to the Scout Oath and Scout Law. Our job is helping boys become Scouts. We do that by treating them as Scouts, following the Oath and Law. We respect them as we would like to be respected. We show them what it means to be a Scout by our own behavior and we help them fulfill that aim of becoming one who is worthy of being called a Scout. 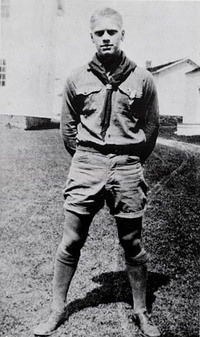 So next time you find yourself thinking that the members of your troop aren’t up to a task, aren’t capable of leading themselves, configuring their own patrols, planning a campout or running a troop meeting, stop thinking of them as merely boys and start thinking of them as Scouts. You’ll be amazed at what they can do.